Paleogeographic reconstruction of the North Sea appr. 9000 years ago during the young Holocene and after the end of the last ice age. The Holocene is the present geological epoch. It is also called the Recent epoch. It is the second stage in the Quaternary period. 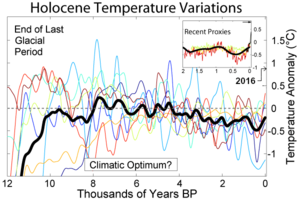 The Holocene marks the end of the previous series of ice ages in the Pleistocene. It started about 11,700 years ago when the temperatures rose quickly from the previous level. During the early Holocene, there were many extinctions amongst larger mammals. This is attributed to a combination of human hunting and climate change. ↑ Martin P.S. and Klein R.G. eds 1984. Quaternary extinctions: a prehistoric revolution. Arizona, Tucson AZ. This page was last changed on 28 March 2019, at 12:05.